For a comfortable, functional and great looking watch, you have come to the right place. 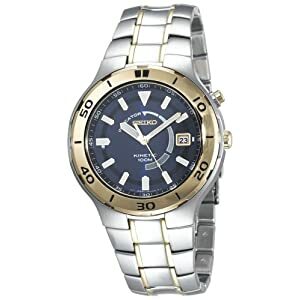 This is a stainless steel, gold and silver two-toned watch with a dark blue dial that looks nearly black. And it's a kinetic, so never worry about buying batteries for it. The face shows the reserve power, which can last for up to 6 months!